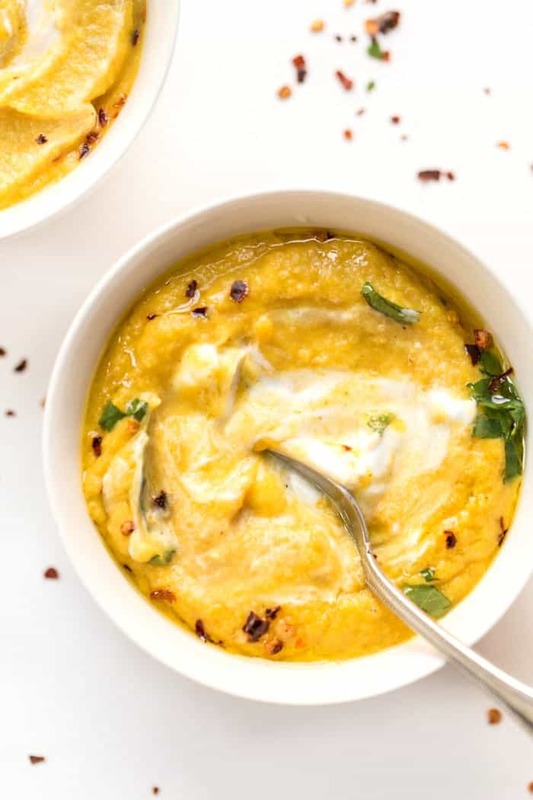 This Curried Cauliflower and Squash Soup is the perfect creamy texture, packed with veggies and tastes delicious! It's also naturally vegan and freezes well too! I am so excited about this recipe. I've always loved creamy soups and I have quite a few in the archives that need some updating. 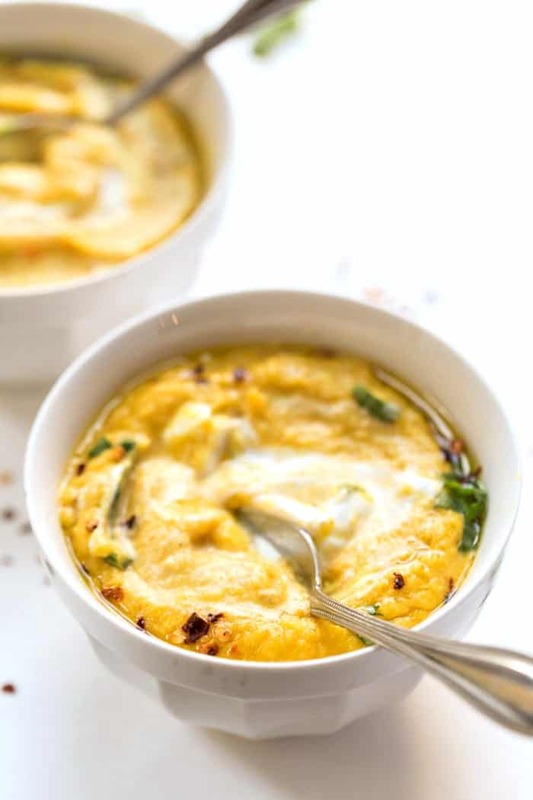 I chose this Curried Cauliflower Squash Soup because acorn squash is in season, it's starting to get very chilly here in NYC and it has the BEST flavor! In all honesty, it's been at least 5 years since I've made this recipe. 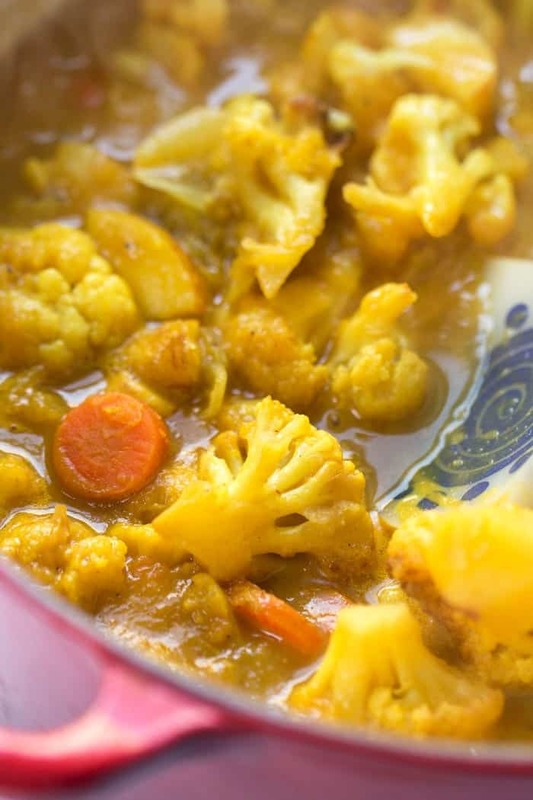 But as soon as I sliced smelled the sweetness coming from the roasted acorn squash mixed with the savory nature of the curried cauliflower, it was like a flashback. A flashback to my life before New York, when I was living in a studio apartment in Burlington and exploring the world of gluten-free cooking. Makes me smile just thinking about it. I was also learning how to use my camera which is why my photos were terrible. But the recipes are still delicious which is exactly why, slowly but surely, we'll be updating these old posts and giving them a new and refreshed look! I'll admit, this soup isn't a one-pot wonder like many of my others. We do need to roast a few things, saute a few things and simmer a few things. But luckily all can be done in less than 45 minutes! And the end result is SO very worth it. Promise. 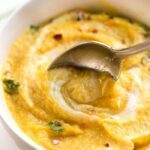 When it comes to creamy soups, I personally have found that a high-powered blender yields the best texture, BUT I also know that not everyone has one of those. The lower budget alternative? An immersion blender. You can get a great immersion blender for around $25 and with a little elbow grease, it will still give you a velvety smooth texture. Here's the one that I like if you want to check it out! I'm all about the toppings for creamy soups. I find that while I just adore the smooth texture of the soup itself, having something a little different keeps me interested in the bowl in front of me. 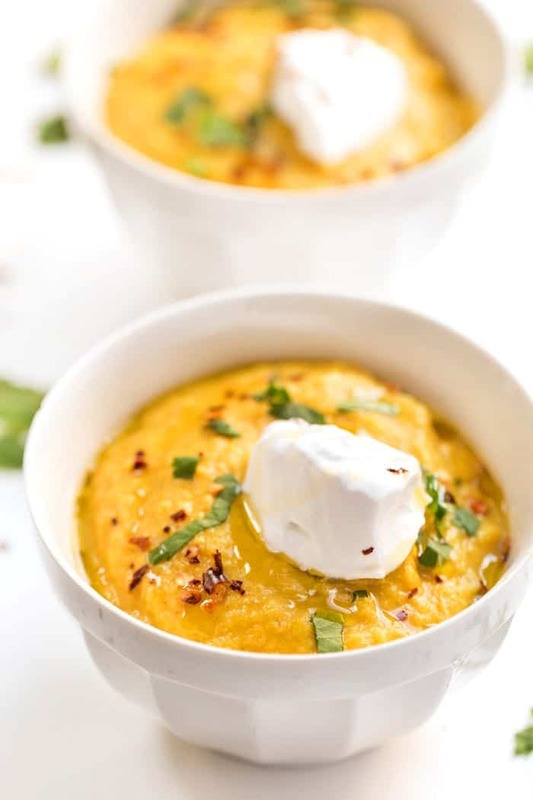 For this Curried Cauliflower Squash Soup, I went with a giant dollop of coconut yogurt, some red pepper flakes, some cilantro and a drizzle of olive oil. I also think pumpkin seeds, hemp seeds, fried garlic, parsley or even coconut cream would be equally delicious! This soup has reminded me how much I LOVE acorn squash. 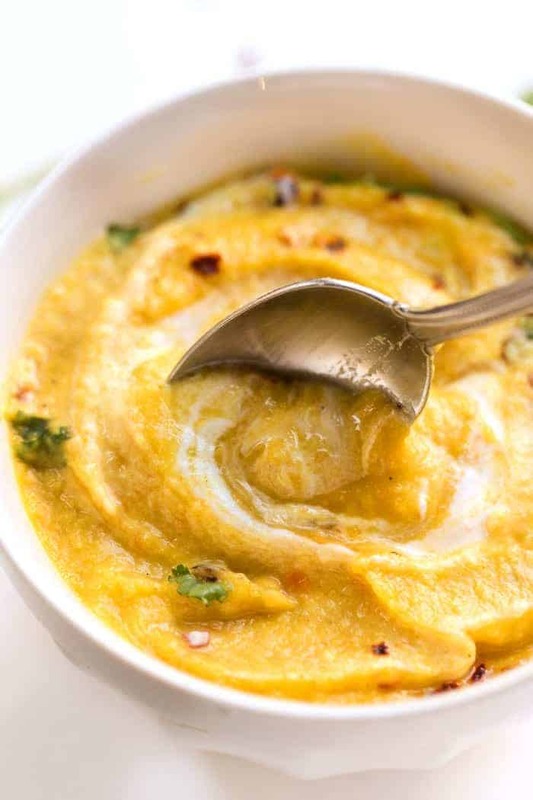 It's sweetness, combined with the aromatic spices and smokiness from the roasted cauliflower, comes together in what I might describe as one of the best squash soups out there. It's unique, it's interesting, it's flavorful and it's packed with goodies! Definitely one that you need to whip up when the wind is howling outside and you're craving something warm and cozy. Preheat the oven to 400ºF.In a shallow baking dish, add 1/4 inch of water and place the two squash halved face down. Place in the center of the oven for 20 - 30 minutes. 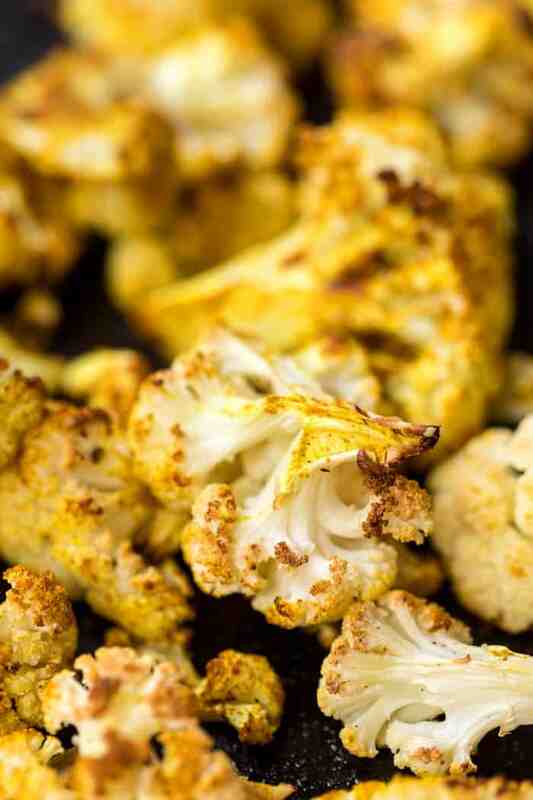 While the squash is cooking, toss the cauliflower with 1 tablespoon olive oil and 1 tablespoon curry powder. Add salt and pepper to taste. Place on a baking sheet and roast in the oven for 20 - 25 minutes, turning halfway through. On the stovetop, heat the remaining tablespoon of oil in a large saucepan (or dutch oven) and sauté the onions, carrots, parsnips and garlic together until the onions are translucent and the carrots have begun to soften. Add the cauliflower when it is done roasting, and sauté for another few minutes. When the squash is done, scoop the flesh out of the skins and add it to the pot. Add the vegetable broth, water, coconut milk, salt, pepper and the remaining curry powder (add more of any if you'd like) and bring the soup to a boil. Turn it down to medium-low and let it simmer for another 10 - 15 minutes. 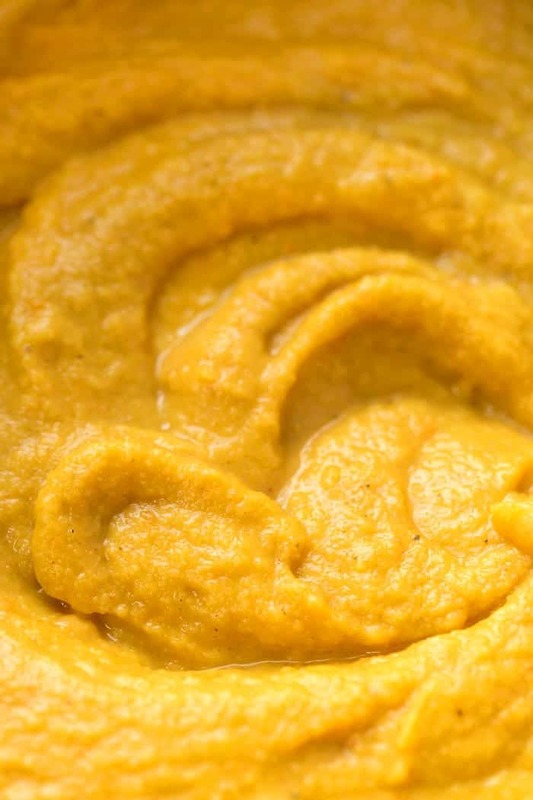 Take the soup off the heat and with an immersion blender, or in a high powered blender, puree it until it's smooth and creamy. Serve hot and garnish with a touch of coconut milk (or yogurt) if you so choose. Enjoy and stay warm! Hi! Everyone is writing about your flatbread, but I don’t see it on this recipe? Where can I find the flatbread everyone is talking about? Sounds amazing, would love to try it with this soup as well!! What a nice soup. Great!! Yes! You absolutely can. Just grind it up (I recommend toasting the quinoa first in a dry skillet) and then you can sift it to get any of the larger pieces out that didn’t get ground as fine. I wanted to write and thank you for the quinoa booklet. I plan on making the curried cauliflower soup and the quinoa flatbread. I usually make my own curry powder which I’m sure will suit both of these recipes. However, I was wondering what brand or mix of curry you used as I think I would like to use the same. Thank you for your wonderful tasty recipes. Hi Yvonne, you know I can’t completely remember what brand I used as I usually get my spices in bulk. I have tried this brand before though, so I definitely recommend it! Marking this as a MUST for this weekend…Question…here in France, Psyllium Husks can be found in almost too many forms..and I want to be sure of the “format” to be able to reproduce your exquisite recipe and do it justice in a flatbread/cracker texture!…In my local épicerie “bio” they sell it in a “bushy” almost pre-steamed format…in tiny black grains (loose…like chia or flax) format…or in a powdered form ..but more rarely (found in the pharmacie here and looking a bit like Metamucil! )….Do you recommend one of these types for gluten-free baking?…Recent, impressed discoverer of your fertile mind and culinary creativity! Thank you for your generous sharing of your myriad ideas! Hi! I don’t have psyllium husks right now, but I do have xanthum gum (which I didn’t know was corn based, thanks for that info!) and was wondering how much of the gum I would put in the recipe? Honestly, I typically just sub them one for one and in this recipe it works out fine. If the recipe called for a larger amount of psyllium husk, the ratio might be different, but for this one it’s pretty simple. Let me know how it works out for you 🙂 xo! Ok, thanks! 🙂 I have only used xanthum gum once or twice at this point anyway, so I wasn’t sure how to sub it! I’ll have to give the flat bread a try here in a day or so (when I have some time). 🙂 Have a great Christmas! LOVE this!! I just found you through the CLEAN blog! Do you think you could sub quinoa flour with chickpea flour or almond flour?? Would is change the texture too much? Hi Jess – welcome! So happy you found me! As far as substitutions go, I think that you could easily sub another flour. Chickpea would be fine, but almond flour has different properties, so most likely wouldn’t be the same proportions of liquid. I think you can take it as it goes and if it’s too dry, just add a touch more water. I’m guessing you’ll only need to add with almond flour rather than using less. Hope that makes sense! I LOVED it!! I halved the recipe and used almond flour and no onion powder and it worked GREAT!! I paired it with my butternut squash soup! I just blogged about and added your blog to it to make sure they come to your blog to get the recipe! Thanks for an awesome one! Thanks for stopping by Jasmine! I absolutely love psyllium husks – I use them in gluten-free baked goods instead of xanthan gum (which is corn based) and they're wonderful. Let me know how they turn out for you or if you use them in any other recipes! How is the cleanse going? You must be almost done by now! I hope you've found some great recipes and are enjoying the new way of life. It definitely changed the way I looked at eating by the time I was done. Hopefully you made it work with the psyllium husks. I've been using them in baking instead of xanthan gum (which is corn based) in all my baked goods and I love them! Have you tried any other recipes using them? Let me know how everything is going! So I went to Whole Foods to buy Psyllium husk to try your fabulous recipe for quinoa flatbread. I looked in the baking section because I didn't know what psyllium husk was, exactly, and since it was in a baking recipe, I could find it. Anyway, I finally asked someone and the young woman who showed me where it was (in the supplement section under fiber supplements) asked "Are you looking for it for gluten-free baking?" I was like, "Yes!" Anyway, I went home and today, as I was getting a piece of salmon ready to saute in coconut oil, I thought, as I sprinkled truffle salt on to its moist, pinky flesh, "Wouldn't it be great if I could put some bread crumbs on this?" Anyway, I thought of the psyllium husk I had bought and that comment about gluten free baking. It was delicious! It tasted like panko crumbs, except I knew it was healthy! I was going to post on my blog about it, but then I thought about what they say in the directions– that taking the product without enough liquid could cause choking. Do you think that if I posted about coating salmon with the husk and then cooking it it might be dangerous? I know you're not a doctor or anything, so don't worry– I won't hold you to an answer or sue you or anything. I more wanted to know if this was something that was a discussion in the gluten-free community? As people are using psyllium in baking and cooking, are there certain precautions one should take? THANK YOU so much! Your food writing is changing my life! So happy I can help. It's funny, the cleanse seems so limiting when you think about it, but when you actually start cooking Clean recipes, it's amazing how many recipes you can make. And they're all so yummy too! Thank you for all your kind words. I'm happy that my recipes inspire you. I feel so grateful! Please continue to let me know how it goes! I checked out the link: so excited! 🙂 My only issue is that I don't know which recipe to try first. I mention you in my first blog post (raving about your soup, of course) and in the standing page– because reading your blog inspired me to go on the cleanse! So thank you so much for your wonderful writing and passion for life. AND your creativity! I saw you even have some desserts on there– and I too love SNACKS! So I'm pumped to make my own crackers. This is in fact Clean! This is by far my favorite soup that I made and the quinoa flatbreads are also clean, so perfect for a lunch (perhaps a pizza or wrap?)! I recently just added a new category that tags all my Clean posts. I have some treats, snacks, lunch, soups and smoothie ideas on there. Just checking– you're going to be my go-to-girl (Queen?) for the Clean program. This meal is clean, yes? I skimmed the ingredients and I think it just might be! You are SO TALENTED. I can't wait to try this as part of my 21 Day Cleanse! Glad you found the recipe! It's just so great isn't it? I made it the other night as a pizza crust and it was awesome! I definitely recommend playing with the flavors – there's so much you can do! So happy you found my recipe! Quinoa flour is amazing – it packs all the protein and flavor that the grain does, but you can use it in so many different wants! To sub the psyllium husk, I would try flaxseed meal. The psyllium is really just used to help bind the bread (so you could try a gum – but if cleansing I would avoid them). You could also try chia meal or straight chia seeds (maybe add a touch more water) and see if that works out. Let me know how it goes – the fresh basil you posted on the Clean site sound divine! can't wait to try this flatbread. Do you have any suggestions on what I can use in place of the psyllium husk? I don;t have any on hand right now and I really want to try making this flatbread tomorrow. i dont know what i like more.. the soup or the flatbread! i think i love the creamy cauliflower with acorn!